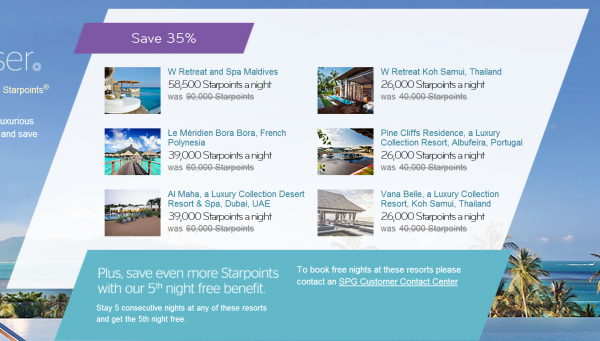 SPG has extended back Paradise Got Closer award discount promotion at 6 resort properties for stays until March 3, 2015. You will save 35% off of the usual number of Starpoints required for a free night. It get’s better if you can stay for five nights, because you can combine this offer with the fifth night free award discount. You can access SPG’s website for this promotion here. Note that you cannot book this award type online. You must call in. The number of Starpoints required for awards at these properties at the regular level make no sense at all (I need to update the piece I wrote about this topic the other year). If you can combine this 35% discount with the 5th night free (basically another 20% off), it can start to make sense. Offer only applies to the participating property’s most basic room category that can be booked using a Free Night Award redemption (which in some cases may include suites) and is subject to the participating properties existing SPG redemption policies. To update your communication preferences or learn about our privacy practices, view our Privacy Statement on spg.com/privacy, or access our privacy information line by calling 1-877-782-0071 in the U.S. and Canada or +353-21-4930474 in all other countries. Starpoints, SPG, Preferred Guest, Sheraton, Four Points, W, Aloft, The Luxury Collection, Le Méridien, Element, Sheraton, St. Regis and their respective logos are the trademarks of Starwood Hotels & Resorts Worldwide, Inc., or its affiliates.